UAE batsman Shaiman Anwar rued the absence of regular players and fragility of the top order as the hosts lost the three-match ODI series to Nepal 2-1 in a tense battle at the ICC Academy in Dubai. UAE are missing three players for the clashes against Nepal – regular captain Rohan Mustafa, Ahmed Raza and Rameez Shahzad. All three were suspended for eight weeks by the Emirates Cricket Board last month for their outburst on social media over playing conditions during the Emerging Teams Asia Cup in Pakistan. Their absence was felt on the field. UAE struggled to chase down 113 in the first ODI against Nepal – winning by three wickets – before being blown away for 97 in the second match chasing 243 and then going down by four wickets defending a total of 254-6 in the decider. Anwar said in the absence of the three players, the UAE were always swimming against the tide. “With the three players missing, you can saw we lost almost half the side. Still, the boys tried very hard,” Anwar told Sport360. In the third match of the series, veteran batsman Anwar moved down from the number four to number six position as the top order batsmen had failed to handle Nepal seamer Sompal Kami and star leg-spinner Sandeep Lamichhane. That decision worked to an extent in the deciding match as the UAE – reduced to a 2-2 after openers Ashfaq Ahmed and Chirag Suri were out for ducks – posted a healthy total of 254 thanks to Anwar’s 87 off 70 balls with fine support from Mohammad Boota (59 off 31) and CP Rizwan (45). However, a captain’s innings of 115 from Paras Khadka handed Nepal their maiden ODI series win. Anwar said whenever a team loses wickets early, it becomes very difficult to win an ODI. “When you score 250-odd, you require an outstanding bowling effort, a brilliant catch or a run-out to win the match. While I am glad to score runs, the fact is our top order failed and you can’t expect to win international games if it keeps happening,” the 39-year-old said. Anwar gave the example of the ongoing ODI series between New Zealand and India where the Kiwis lost two wickets in the opening powerplay in all games while the Indian top-order delivered three times to secure a series victory. With the ODI series lost, the focus shifts to the three-match T20 series against Nepal at the same venue, starting Thursday. Anwar is a lot more hopeful about succeeding in the shortest format. “T20 is a format that is made for us. All our players play regularly in that format and we are confident of putting in a much better performance in the T20 series,” the batsman added. Nepal defeated the UAE by 145 runs to level the ODI series 1-1 on Saturday at the ICC Academy in Dubai. Nepal put up a much better batting display in the second ODI against UAE in Dubai, learning from their mistakes in the opening game. Openers Gyanendra Malla and Binod Bhandari added 56 for the first wicket in 14 overs. Fifty from 16-year-old Rohit Kumar Paudel helped Nepal post a challenging 242-9. In the chase, UAE were all at sea as they reduced to 50-4 after 10 overs. Sandeep Lamichhane and Sompal Kami took nine wickets between them as the hosts were bowled out for just 97 in 19.3 overs. Get the live updates below. UAE players are ready for what promises to be a cracking limited overs series against Nepal, beginning in Dubai from Friday. 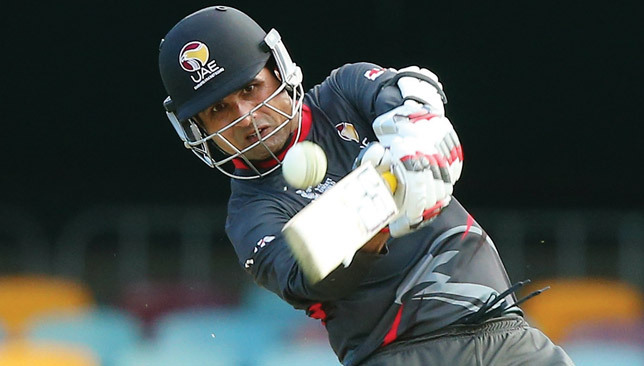 UAE host Nepal in a three ODI and three T20 series at the ICC Academy. Nepal, who recently gained ODI status, will have star leg-spinner Sandeep Lamichhane in their side, which will be a boost for the visitors. Adding to the intrigue is the suspension of three UAE players for their outburst on social media. The Emirates Cricket Board suspended Rohan Mustafa, the then captain, Ahmed Raza and Rameez Shahzad for eight weeks in December after they posted tweets expressing their anger following UAE’s exit from the Emerging Teams Asia Cup in Pakistan. In the tweets, the three had criticised hosts Pakistan Cricket Board after their final pool match against Hong Kong was washed out following a brief spell of rain. Fast bowler Mohammed Naveed has been handed the captaincy. With the enforced changes, the pressure will be on UAE to deliver against a fast-rising Nepal team and batsman Chirag Suri said it’s up to the players – especially batsmen like him – to take up responsibility and make up for the absence of the players. “The added pressure is good for you. It means more responsibility as batsmen because you have to value your wicket more,” Suri told Sport360 on Wednesday. The main threat to UAE will be posed by star leg-spinner Lamichhane who has become a household name in the T20 world within a span of 12 months after making his IPL debut last year. Since then, the 18-year-old has played in all major franchise leagues across the globe, including the Big Bash League. While the leg-spinner is a force to be reckoned with in white-ball cricket, Suri said his team’s batsmen need to play the ball and not the bowler. “Sandeep is a world-class bowler. But for us, we have to treat him like any other leg-spinner. Our batsmen have faced him before. He is a class bowler and we respect him but we must face the ball and not the bowler,” Suri added. Despite the changes in the team, Suri said the squad is motivated enough and has adequate bench strength to remain focused on winning. “The preparation has been very good. Since it’s the first bilateral series against Nepal, players are highly motivated,” he added. All matches will be streamed online via Emirates Cricket Board’s social pages.